I've been playing with the Paperartsy masterboards challenge, and created this masterboard using acrylic paints, Ryn stamps, a snowflake stencil and heat embossing. More about the process here. The bard I made was quite small, added up to only these two panels :) The colours are not traditional Christmas colours, but the sentiment is "Merry Christmas" in Finnish. 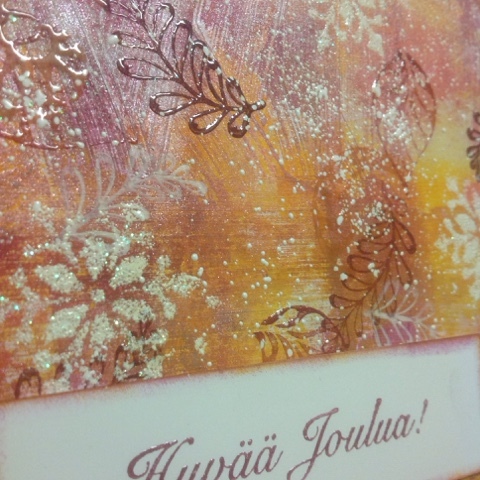 Hey Kristiina, I love that the colours are not traditional. I find that winter is a time where I miss the sun and vibrant colours of summer. 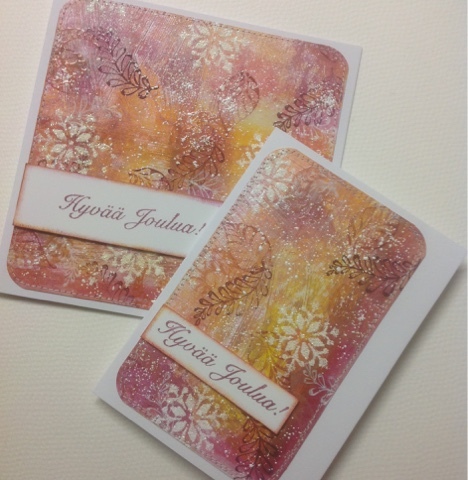 This is a very welcome bit of sunshine for the holidays :) Lovely texture and layering! Lovely cards, and the colours are perfect. They give a warm and sunny feeling, and we all can use that in wintertime! Thank you for joining the challenge at De Stempelwinkel! WOW these look fabulous, beautiful work.